It is copyright © Antoine Cazé and Jacket magazine 2010. See our [»»] Copyright notice. When I was a schoolchild, my first English textbook, edited by P.-M. Richard & Wendy Hall (L’anglais par l’illustration, 1972), had cartoon-like images on the left-hand-side pages and the text of the corresponding lesson on the right-hand-side ones. In class, we were required to use an opaque black plastic flap, or interleaf, to mask the text so that we had no choice but to speak about the images with the few words we had at our disposal. The temptation to lift the flap was permanent and great, so tied were we to the written transcriptions of sounds, to imagining sound shapes as letters only, to making sense with language. I can still feel the slightly grainy texture of the plastic interleaf between finger and thumb, imprinted in my memory at the same time as the early rudiments of English. This feeling is there, connecting visual images to mental ones suggested by sounds, then turned into words. Matching image to word to sound to sense? How does a writer account for these connections/contentions? Observe the etching lines of “THE SECOND OLDEST VIEW OF BUFFALO,” a reproduction offered as the frontispiece to Frame Structures. See how their preindustrial grid echo the hard crisscrossing metal of the Wharf Sculpture on the book’s cover. The busy lines of a night battle in 1812; the cool, detached industrial lines of a foggy morning “overlooking Boston Harbor” in 1972. 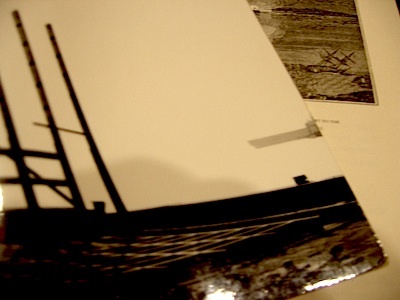 See again how the silhouetted ship looming into sight from the right-hand side on the book cover announces the horizontal shapes to the right of the engraving. Boston to Buffalo to Boston, crossings, crisscrossing, framing the early years of Susan Howe’s life 1937-1941. Frames for these structures; visuals framing dates framing histories, 1812-1941, naval battles. Women and children experience war and its nightmare. 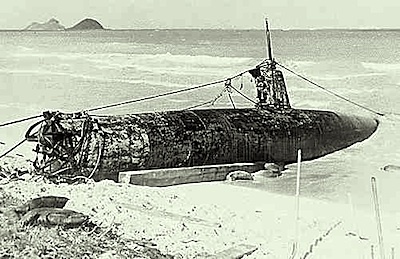 Their war-dreams share with dreams of other kinds that they are occurrences full of blown sand seaward foam in which disappearance fields expression. Clouds must have come under the western edge of the old suspension bridge. “Disappearance fields expression”―what expression gets distributed, fielded, through disappearance on this field? This battlefield of language? It is the obscuring part that leads to the expression, making sense come under and out of the disappearance it provokes. 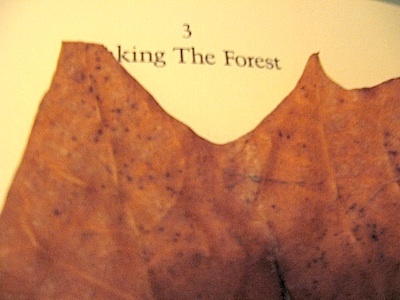 The relation between this blank hole at the center of the image―a disappearance which is the thick of the battle (the fog of history)―and the vanishing signs of the text is the focal/fog-all point of Susan Howe’s pages in her books; it concentrates the fields of her pages as multidimensional battles of signs, visual and linguistic tangle. On Sunday, December 7, 1941, I went with my father to the zoo in Delaware Park even now so many years after there is always for me the fact of this treasured memory of togetherness before he enlisted in the army and went away to Europe. So, this blank spot in the middle of the engraved battle can only yield to other lines, lines of text, lines of writing that loom through the hole in the image, on the other side of the page, glimpsed in the opaque transparence of an absence. Engraving the “treasured memory” through image in(to) text. 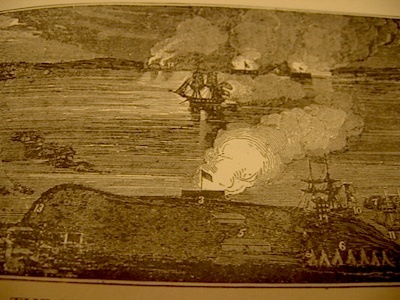 This “view” of Buffalo at war in 1812―in which nothing of the city is actually viewable―“directly” short-circuits through the page to Flanders (WWI) and on to Pearl Harbor (WWII), looming up overleaf. It transfers us there. How does one transfer from image into text? And back? Can one superimpose these two categories without transgressing or trespassing into territory that threatens to engulf one? Without risking to vanish in the process? Becoming ghosts? c. An impression of a signature made by folding the paper over while the ink is still wet. COINCIDENCE: The fact or condition of being coincident; the occupation of the same place or part of space. “There can be no Coincidence in the Eye, or Visual Point.” (Francis Bacon, Sylva, 1677, §244) [… ] “The singleness of the picture arises from the coincidence of the two pictures.” (Sir David Brewster, Memoirs of the Life of Sir I. Newton, 1855). INCIDENCE: Physics. The falling of a line, or anything moving in a line (as a projectile, a ray of light, heat, etc.) 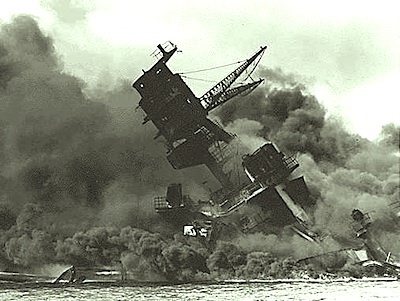 upon a surface; the manner of such falling, esp. in regard to the inclination of the line of incidence to the surface. 1704 NEWTON Opticks (J. ), In equal incidences there is a considerable inequality of refractions. The incidence of drawn lines as they fall onto written lines. 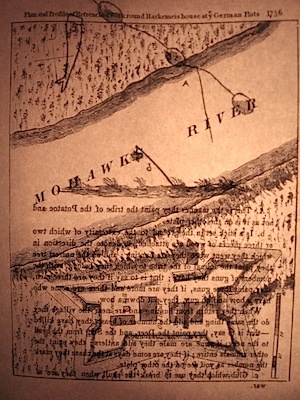 This blank spot in the oldest view of Buffalo, at once whitened out & obscuring, gives onto the block of text overleaf, a text which specifically “gathers in the missing”: our gaze is absorbed through the page and through time, from (not) seeing to (mis)reading, bleary blurred by intervening snapshots of what is not shown except in our mind’s eye. Lines represent the limits of bodies encompassed by the eye. This suspension, in the missing. Animals sense something about ruin I think he said our human spirits being partly immaterial at that prefigured time though we didn’t know then how free will carries us past to be distance waiting for another meeting a true relation. Everything, then, is a question of such a “true relation”―narration and links, broken or impaired both. The relational work accomplished by the image comes from the fact that the visual material is treated textually, and the other way around; visual material interacts with textual material, each displacing the other into different frame structures, a concomitant disembodiment and rematerialization of signs as they become differently spaced, both framed and unframed. Absence is always present in a picture in its right relation. There is a split then how to act. Laws are relations among individuals. What kind of absence do these relations bear, or bear the traces of? How is it possible to express the relational work of history? 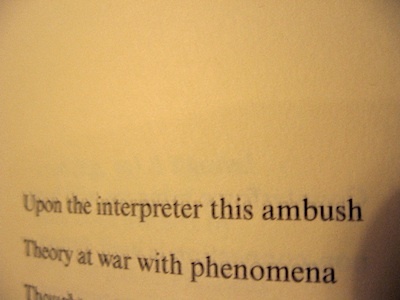 That is to say, how can texts tell the way in which history―when perceived and transcribed not in its master narratives of grandiose coherence, but more correctly in its relation with our “real” lives―impacts the intimacy of these our lives? Intimacy means the sum of relations someone decides to subtract from the social space of exchange in order to preserve themselves from them and build their life experience sheltered from other people’s gazes. The space of intimacy therefore results from an act by which a subject decides to subtract part of himself and his relations from the domain of shared visibility. The relational space is the thing that’s alive with something from somewhere else. 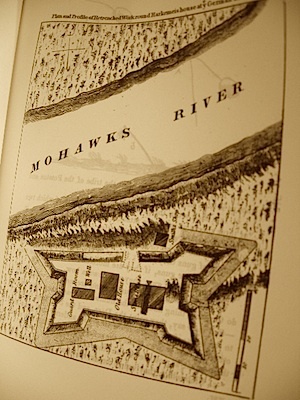 There is this endless fascination in Susan Howe’s work for the capacity to relate widely disjointed fragments in such a way that they do connect into a sense of intimacy, touching the precise spot at which historical events become meaningful for each of us without ever yielding to the seductions of the grand design, aka History. This retreat into a domain of different, intimate, visibility is accomplished by spacing out one’s relations with shared experiences in a medium allowing for transparency. This medium is the transactional space of the page as such. 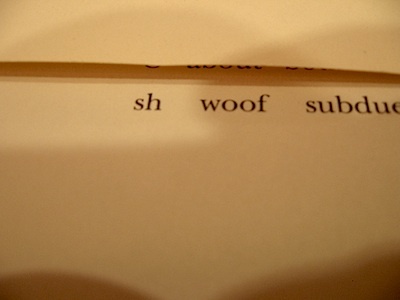 Because the page is this thin, semi-transparent surface of paper, it allows for all kinds of “sub-scripts” (the term is Alan Golding’s in “Susan Howe’s Visual Poetics,” We Who Love to Be Astonished, 154) or partial visibilities to surface, which Howe’s books not only take as their topics but actually enact in their very design and composition. 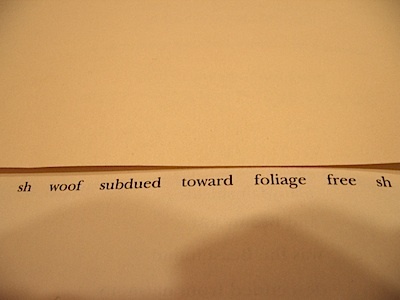 Observe Susan Howe’s propensity to superimpose blocks of texts or images, or a combination of both, that take up exactly the same space on either side of a book’s page. For instance, the two frontispieces to Thorow in the French edition: the frame of the “Plan & Profile” conditions the layout of the second plate, which fits entirely (except for one “potato” shape sticking out at the top) inside the ghost frame appearing in transparency. Or again, observe on p.73-4 of The Midnight, how the two images shadow across each other, the interleaf looming on the frontispiece to Stevenson’s book reduplicated as a page looming obliquely across Alice in Wonderland―one translucent white, the other black. What kind of transaction is taking place in the trans-apparition of these folded pages? 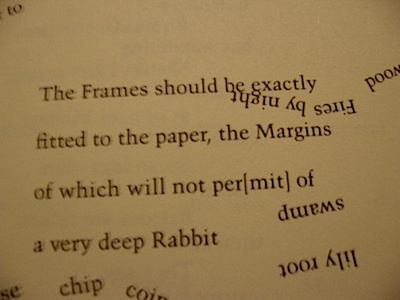 When reading Susan Howe’s books, I cannot resist seeing the coincidental ghost of text shapes piercing through their pages; the page becomes a field of shifting frames for shapes/shades that are simultaneously, trans/parent/ly, text and image. SCRAP: 2. A remnant; a small detached piece; a piece very small by comparison with the whole; a fragmentary portion. b. 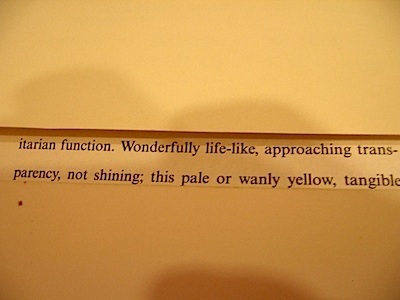 Of immaterial things, conversation, literary compositions, etc. Observe for instance how, in The Midnight, “Bed Hangings I,” blocks of texts can be seen in transparency, superimposed upon each other from page to page, in sequences of 8, then 9, then 10 lines. 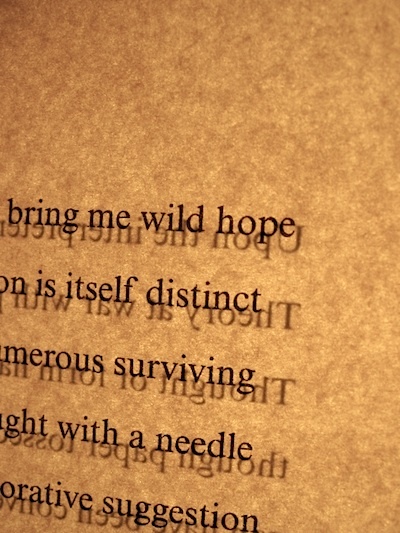 There is a slight gap in the alignment of each text upon the other that makes them appear, in transparency, as projected shadows, or ghost images, of one another. Co-incidental. Transparency is not “clarity”: quite the contrary, Howe’s superimposition of images & texts preserves both the possibility of a transfer (in the graphic art sense of the word) and the blur imparted by the remaining, or spectral, contours of “shadow documents”―which is to say, crucially, alternative versions of the historical records Howe mostly works with & through. 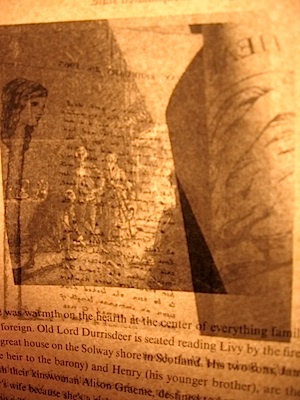 The important point here is that these documents can be called “shadows” because of their material contribution to the space of the page: the page becomes a trans-material support for the re-inscription of displaced histories, or even better the history of displacements: the removes of Mary Rowlandson & of Hope Atherton, for example. other side is what will happen. 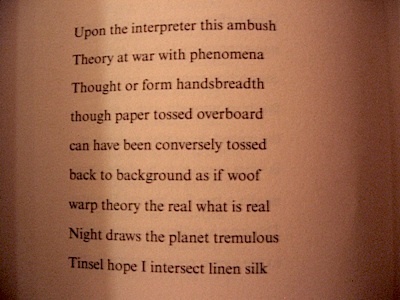 Precisely, it is the other side as event, as happening, that carries the full force of Susan Howe’s page as a relational space. Hanging “unfinished” on one side, her words need to be transferred to the other side in order to “happen.” The book becomes this space of constant reciprocal projection, intersection of happenings in the very grain of the paper, the reader trying to perceive these transactions/relations, to capture them through the paper, literally. A military disposition consisting of troops concealed in a wood or other place, in order to surprise and fall unexpectedly upon an enemy. 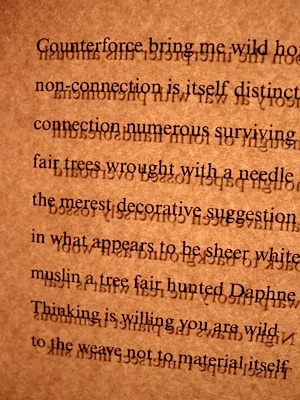 This texts ambush reading―in the thicket of overleaf connections between signs of primeval meaning, we are redirected to the actual trees of this pages, “fair trees wrought with a needle.” A book is made by sewing trees together. Thought paper, though paper, through paper. Daphne, turned into the laurel, the emblem of Apollo. TINSEL: 2. A kind of cloth or tissue; tinseled cloth; a rich material of silk or wool interwoven with gold or silver thread; sometimes apparently, a thin net or gauze thus made, or ornamented with thin plates of metal; later, applied to a cheap imitation in which copper thread was used to obtain the sparkling effect. TINSEL: Brushwood for hedging or fencing. 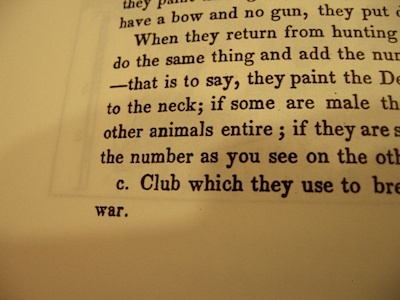 The field of forces created by these words and shapes is remarkable: our perception of this pages is torn between reading words for their meanings and seeing words for their shapes, “Theory at war with phenomena.” The beauty of these page lies in their constant interleaving of the two acts, reading and seeing, making us relate with the space of this multifoliated text as the actual event, rather than its telling: we are plunged in the condition of “intersect linen silk”, the lines of this linen/page woven at level of each letter, pen stroke, inflection. The tissue interleaf in Ballantrae serves as a whisper and a stage direction. Kinship―sensationally, not linked as each would be if overscored. Folie à deux? Perhaps. A sentence is one unit but inside are two separate syntactic units. 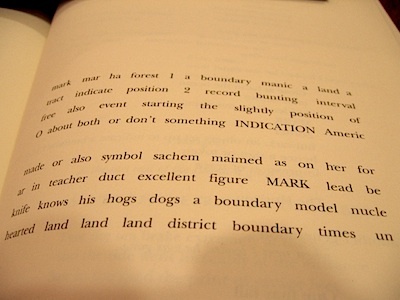 the field of this poem (Frame Structures, 89), artificially and yet necessarily bounded on each side by a typographical hedge, bears on each of its line the scars of a territorial battle waged to mark off the land, the words (woods, woofs) serving as so many signposts signaling boundary positions, or milestones. This surveyor’s work (Thoreau) is challenged by the poetic un-linearity of the “leaking” lines themselves, pierced or “maimed” with holes through (Thorow) which meaning constantly threatens to flow out. 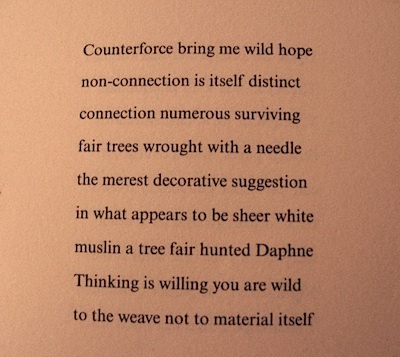 The poem is a compact, compressing in its two-dimensional format the layers of several, incompatible dimensions, spatial and temporal at once―a transgression of lines, a transparent thicket of words. Setting up the page as a recursive space of text in which a self (selve/wood) may appear, folded, as a relational nexus countervailing the linearity of historical accounts. Every mortal has a non-communicating material self―a waistcoat or embroidered doublet folded up, pressed down, re-folded to fit snugly inside. Incommunicado. Words sounding as seen the same moment on paper will always serve as the closest I can come to cross-identification vis-à-vis counterparts in a document universe. I’m only a gentle reader trying to be a realist. Can you hear me? 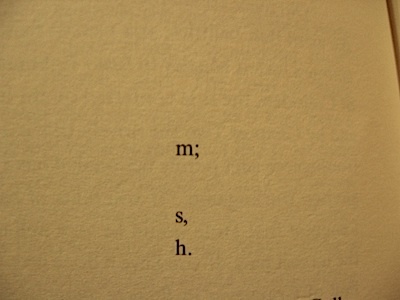 Similarly, the obliterated text on p.78 of The Midnight lets the author’s signature stand out at the bottom, vertically, the “s” separated from the “h” by a comma. DICKINSON, Emily. The Complete Poems of Emily Dickinson. Ed. by Ralph W. Franklin. Cambridge, MA: Harvard UP, 1998. DOOLITTLE, Hilda. Trilogy. Ed. with an introduction by N.H. Pearson. Manchester: Carcanet, 1973. FOESSEL, Michael. La privation de l’intime. Paris: Le Seuil, 2008. HOWE, Susan. 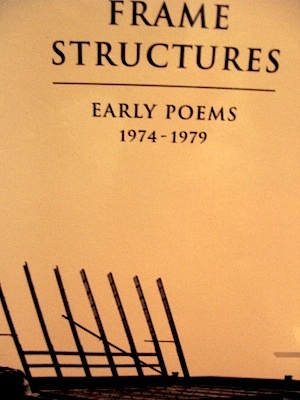 Frame Structures: Early Poems, 1974-1979. New York: New Directions, 1996. ———. 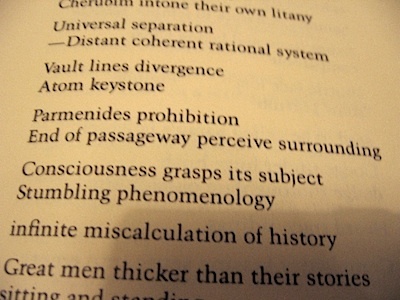 Singularities. Middletown, Ct: Wesleyan UP, 1990. ———. The Europe of Trusts. Los Angeles: Sun & Moon Press, 1990. ———. The Midnight. New York: New Directions, 2003. ———. Thorow. Translated into French by Bernard Rival & Dominique Fourcade. Paris: Théâtre Typographique, 2002.